CAD is obviously a key piece of enabling a Model-Based Enterprise initiative. However, PLM is often an overlooked component. This eBook details the role of both in MBE efforts. This eBook is of most value to engineering managers and executives looking to ensure that their MBD and MBE initiatives are successful. As far as product development initiatives go, it is hard to find one that is being pursued, or at least explored, more than Model Based Enterprise (MBE). Some companies are deploying it because of contractual obligations, especially those in aerospace and defense. Others are seeking new ways to save time, eliminate scrap, and gain efficiencies. Regardless of whether companies are being forced to adopt it or are gravitating to it for their own reasons, MBE initiatives are a hot topic today. Years ago, the biggest barrier to pursuing an MBE initiative was the technology. Few applications provided all the capabilities needed to author and consume 3D models with embedded product and manufacturing information (PMI). But all that has changed in the last few years as powerful CAD and 3D Visualization tools have emerged. 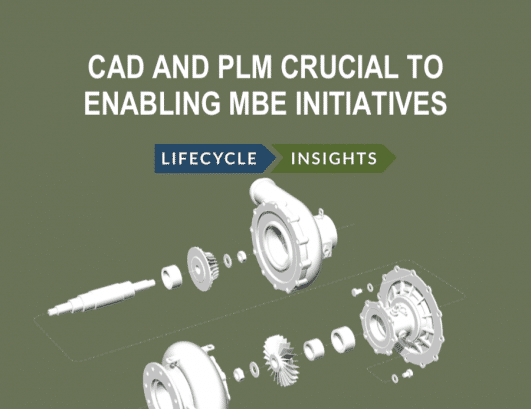 Today, access to the technology to create and consume 3D models with embedded PMI are now the two lowest challenges in pursuing MBE initiatives, according to Lifecycle Insights’ Model-Based Enterprise Study. A successful MBE initiative, however, requires more than powerful CAD and 3D Visualization technologies to author and consume 3D models. The development of these items requires participation from stakeholders across the company, including manufacturing, procurement, suppliers, service and more, to be effective. In today’s world, additional technologies are needed give everyone appropriate collaborative access to MBE deliverables. percent of manufacturers still rely on personal computers and shared drives to manage product data. And 33 percent still use digital documents, desktop applications, and email to execute development processes and projects. Using these technologies can lead to costly errors, such as files or emails getting lost or deleted or stakeholders working with out-of-date versions of CAD files. Fortunately, a viable alternative solution exists. Because it understands CAD files intimately, modern PLM systems provide the necessary capabilities to track and manage MBE deliverables. Furthermore, PLM provides capabilities to share and collaborate on these deliverables in a controlled manner, even between manufacturers and their suppliers. Covering all of these topics and more is the purpose of this eBook. The first part of this book dives into the sometimes- confusing terminology associated with MBE initiatives. Next, the eBook discusses the process-centric and collaborative nature of MBE efforts. After that, it compares basic digital technologies, including desktops, shared drives, and email, to PLM systems. Finally, we’ll wrap up by analyzing the benefits of MBE efforts, both from an individual and organizational level. MBE initiatives offer great promise, but they are inseparable from the processes that create their deliverables. And while technologies are now in place to author and consume such deliverables, more progress is required to facilitate the process.